Jane Fonda continues to be one of the most loathed/hated/despised individuals of all times. 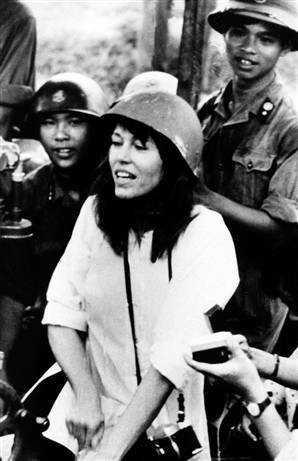 “Hanoi” Jane Fonda tells US military veterans boycotting her movie, ‘The Butler’ to “GET A LIFE”. Larry Reyes, a Navy veteran and founder of the “Boycott Hanoi Jane Playing Nancy Reagan” Facebook has criticized the casting of Hanoi Jane Fonda as Nance Reagan. Gee, ya think? If there was anything ever that might be more boycottable that this American traitor be cast as the beloved former first lady Nancy Reagan, I am not sure what it is? Because nothing says Nancy Reagan as does Hanoi Jane. When Jane Fonda was cast as former First Lady Nancy Reagan in Lee Daniels’ forthcoming film “The Butler,” some Reagan fans were not pleased. Now, with the biographical due to hit theaters in October, a movement to boycott the movie is gaining some momentum. So the uber-LEFTY Jane Fonda thinks that it is perfectly A-O-K for her to protest and boycott the Vietnam War, but it’s not ok to boycott her movie? Seems like typical liberal hypocrisy. One might want to tell Jane Fonda to “GET A LIFE”! Ted Turner was transformed from a staunch conservative into a bleeding-heart liberal by none other than one-time wife Jane Fonda, according to the media mogul’s outspoken son. But when the senior Turner moved to the left and then expressed an interest in running for president, Fonda deep-sixed the idea by saying she’d dump him, Teddy Turner told Steve Malzberg on Newsmax TV’s “The Steve Malzberg Show.’’ “I was raised in a different time at the Turner household … a very conservative household with capitalism and all of that kind of stuff,’’ Turner said. But in 1991, when the senior Turner wed the Oscar-winning actress and exercise guru — once labeled “Hanoi Jane’’ for her controversial support of the North Vietnamese — things changed dramatically. Jane Fonda … Cry Me a River. It’s about time that Hanoi Jane understands that there are consequences to one’s actions.This delusional lib actually thinks that she can be allowed to use her First Amendment rights of freedom of speech to write a book; however, others are not allowed their freedom of speech to protest and denounce the same said book. Jane Fonda actually is whining (link is to Fonda’s liberal blog) over people protesting her book and her shilling it on QVC? Seriously? This from the woman, better known as Hanoi Jane, who sided with the enemy during the Vietnam War. How ironic that the leftist, pinko is now trying to make $’s using the capitalist system of QVC to sell books. Imagine taking pics with the very people who were shooting down American service men in Vietnam and some who this clown thinks she has never done anything against her country. 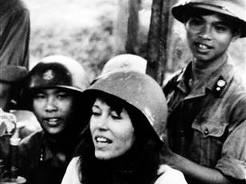 In 1972 “Hanoi” Jane Fonda applauded an NVA anti-aircraft gun crew during her trip to North Vietnam. I was to have been on QVC today to introduce my book, “Prime Time,” about aging and the life cycle. The network said they got a lot of calls yesterday criticizing me for my opposition to the Vietnam War and threatening to boycott the show if I was allowed to appear. I am, to say the least, deeply disappointed that QVC caved to this kind of insane pressure by some well funded and organized political extremist groups. Bottom line, this has gone on far too long, this spreading of lies about me! None of it is true. NONE OF IT! I love my country. I have never done anything to hurt my country or the men and women who have fought and continue to fight for us. Really Jane? Because the picture above of you with the enemy didn’t hurt the United States or the soldiers fighting for this country or those being held in POW camps. You just go on believing that lie. As stated at Jammie Wearing Fool, all one has to do is a simple Google search to find Fonda’s long record of treason. KUDOS to QVC for actually listening to the people who use their services and who are protesting this traitor. UPDATE I: Imagine if the outrage still exists against Hanoi Jane after all these years, what is the protest and boycotts going to be like against anyone, business or media outlet that pays Casey Anthony for making blood money off of Caylee Anthony?